The Bible is a people’s history; but we rarely think of it that way. No wonder we have domesticated the Christmas story by turning it into a festival of gift-giving and consumption, with Santa Claus as its symbol. 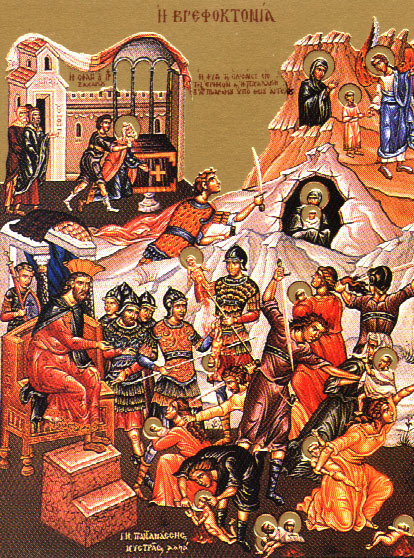 So the story of the slaying of the infants that we read in today’s Liturgy comes as a shock. Such a violent part of the Christmas story just doesn’t fit the jolly mood of the season. We know that there are people who get depressed at Christmas, but that’s a problem for the psychiatrists, right? This, this is different! 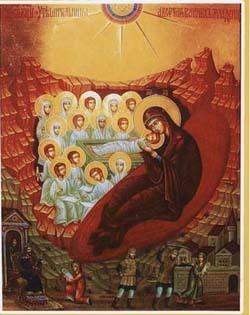 Orthodox iconography is very rich with depictions of this mass killing at the dawn of our salvation. 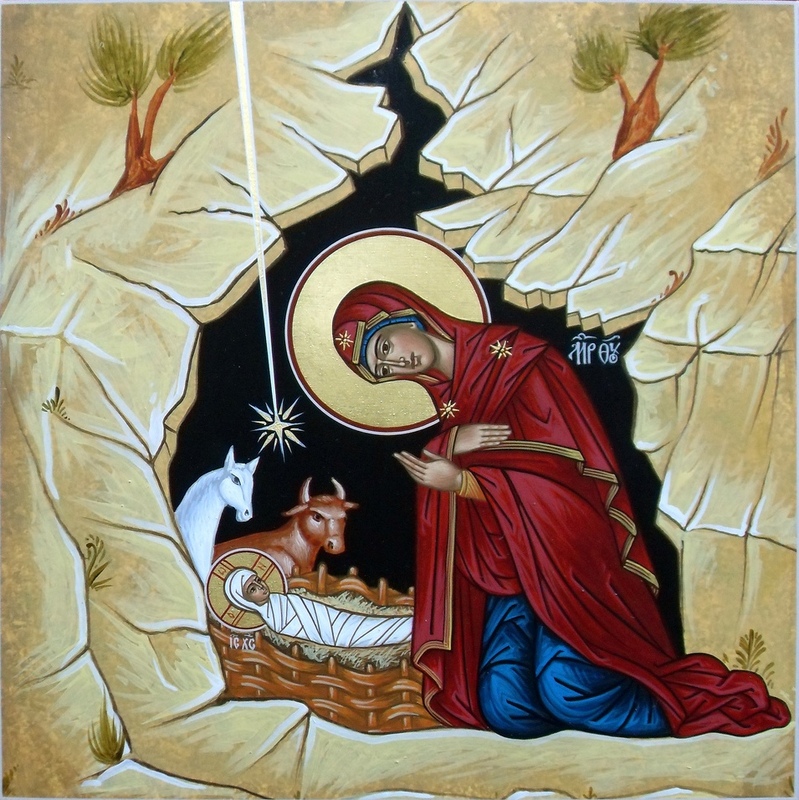 These icons, several of which are shown in this post, give us a different, more sober perspective on the Christmas story. 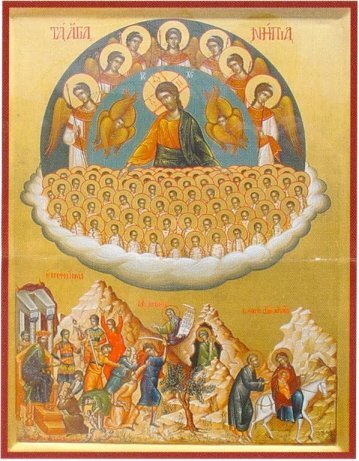 Many of the icons show the infants in the white garments of martyrs. But no matter how much we soften the blow of the story with visions of heaven, the darkness of the story remains. How dare Matthew spoil our good cheer by describing such a horrible incident?! And yet here it is, as a reminder that Christmas is not about Santa Claus, it’s about God entering into a world burdened with great suffering and evil. And so Matthew begins his narrative with the genealogy, to show that Jesus came in the midst of human history, after 42 generations of people who knew their God and their need of God – even if they often failed to live up to God’s commands. 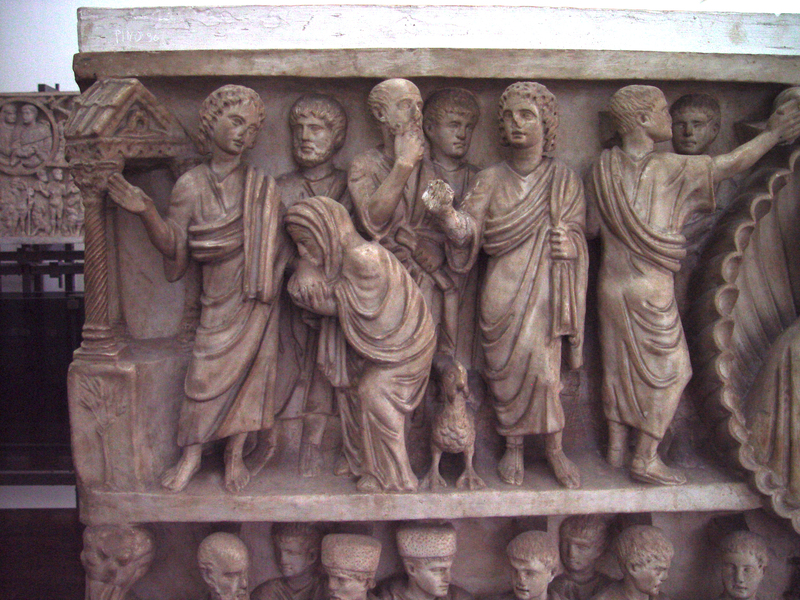 Luke begins his narrative by positioning Christ’s birth within Roman history, the reign of Augustus and the census undertaken by Quirinius. And then when you look at the birth itself, note the cast of characters present: angels (the divine realm), Mary, Joseph & shepherds (the Jewish realm), magi (the Gentile realm), Herod (the Roman realm). They all were brought together by that birth. Their motives were not the same. Yet, they were all in need of the liberation that the Christ child brought. Because that’s what Christmas is all about: liberation. Christmas has been trivialized by the society into a holiday of gifts and parties. On the other hand, there are the rationalists and naysayers who tell us it’s just a myth. Holiday? Myth? How about Christmas as a story of liberation? It seems the only people who can recognize the liberating message at the heart of Christmas are people living under oppressive regimes or dictatorships, or people living in economic poverty. We don’t have that privilege. Most of us are not poor by the standards of world poverty. And we’re not living in a dictatorship. We are free, so free that we can spend hundreds or even thousands of dollars on gifts. And yet, and yet, ARE we free? Is there a voice inside each of us that tells were not as free as we think? We do need to hear the story of the slaughtered infants to remind us that there are powers that seek to destroy what is good in our lives. Perhaps we are not so far apart from the poor and the oppressed of the third-world. Perhaps the Christ-child can help us see that we are all brothers and sisters, all part of that people’s history that he embraced by his birth. He embraces us also, and goes deep into our own wounds and touches them with his healing grace. We need the liberating message of Christmas as much as the poor and oppressed of the world. We need to hear the story of the slaughtered infants. It’s our story too. Daily, the innocence of children is slaughtered, even in our western societies. Daily, there is weeping and wailing, just as in the Gospel story. Christmas is a daily miracle, a daily event in our lives. Yes, because evil also is a daily event, and liberation is a daily need. Christmas, dear friends, Christmas is the highest message of Christianity. I know we say Easter is the key to our salvation. I might disagree – at least today, or until my next Easter sermon. Categories: Sermons | Tags: Christmas story, liberation | Permalink. That is the traditional Christmas greeting for Orthodox Christians. It is analogous to the more familiar Easter greeting: “Christ is Risen! Truly he is risen!” The Christmas greeting comes from the first words of the Oration on the Theophany by St. Gregory of Nazianzus, which you can read in its entirety here. It is not known whether St. Gregory preached this homily on December 25th or January 6th, because in the early centuries of the Church the two days were inseparable. Dec. 25th became a celebration of Christ’s birth, while January 6th was the celebration of Christ’s baptism in the Jordan. But both feasts constituted the key events in the appearance of Christ, hence the word theophany, θεοφάνεια, which means manifestation of God (or the divine). The New Testament tells us almost nothing about Christ between his birth and his baptism (except for two incidents in Luke’s Gospel). Although the two events were separated by about 30 years, the early church exercised spiritual insight by combining the two events into a 12-day celebration of Incarnation-Theophany. And if you ever wondered where the 12 Days of Christmas originated, it’s right here, in the theological wisdom of the early church. Although the idea of the 12 days of gift-giving is more closely related to the later Roman Catholic observance of Epiphany (Jan. 6th) as the Visit of the gift-bearing Magi, the Eastern Church preserved the more theological understanding of Nativity and Baptism being the two key events in the manifestation/appearance of Christ, hence Gregory’s Oration on the Theophany. The incarnation of Christ united human nature to the divine nature. It made it possible for human beings to share in the divine life – what Orthodox theology calls deification. In his baptism, Jesus Christ shared not only our human nature, but the fullness of our human existence. Though he himself had no sins to repent of (except maybe disobeying his mom as a teenager), he joined the crowds who went to John to receive baptism of repentance. But the baptism did more than complete God’s identification with us. By entering the waters of the Jordan, Christ also sanctified all of creation. The earth is essential to our mortal existence. We cannot exist without the earth. God made holy the fullness of our human existence: our bodies, our hearts and souls, and the creation that surrounds and nourishes our lives. This is why on January 6th in the Orthodox Church we have the Great Blessing of Water. We symbolically remind ourselves that the natural world and all life in it are holy to the Lord. He has made all things holy. There is no sacred and un-sacred any more. Everything is holy! Polluting the environment, abusing a dog, or abusing a child are all evil acts in the eyes of God. The traditional period for gift-giving was the 12-day period between Christmas and Epiphany/Theophany. That’s what the popular song, The Twelve Days of Christmas, is all about. Unfortunately, as market capitalism has replaced the Christian lifestyle, the 12 days have lost much of their meaning, even if we continue to sing the popular song. But no matter, the twelve days continue to be the source of divine gift-giving. When we become exhausted from partying and shopping in the days before Christmas, perhaps we might be in a better place to experience the quiet of the divine birth and the immeasurable gift of holiness that it brought into our lives and to the natural world around us. Perhaps during these days between Christmas and Epiphany/Theophany we can learn to experience holiness and sanctification in our own lives and to treat the planet and all life on it as holy gifts of God. We are called to be agents of holiness, just as we are being made holy. Let the Twelve Days of Christmas be more than a song that has lost its meaning and purpose. 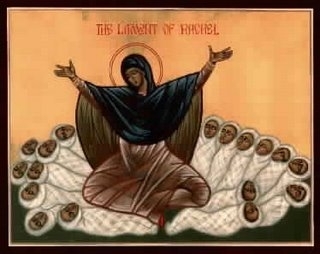 Let them be Twelve Days of Incarnation and Sanctification. 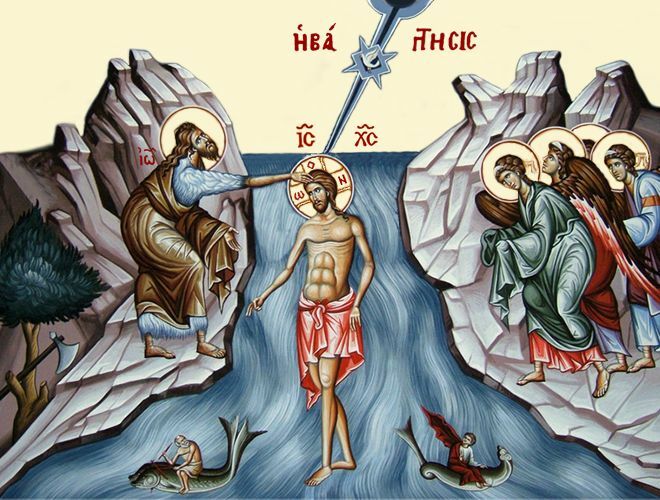 And then, come to the Great Blessing of Water on Theophany and take holy water, as a year-round reminder of what Christ did for us and for the world at his Baptism. May the holy water you take home become the means of a “liturgy of holiness” in your own life during the year. May it be the start of restoring something of the Christian lifestyle in your home! Categories: Uncategorized | Tags: 12 Days of Christmas, epiphany, holy water, incarnation, sanctification, theophany | Permalink. A kindergarten teacher gave her class a “show and tell” assignment. Each student was instructed to bring in an object that represented their religion to share with the class. Funny, but not far from the truth. What are we known for? Our icons? Maybe, to a few of the more intellectually curious people in our city. Our theology? To an even fewer number of people. But almost everyone knows us because of our Festival and bake sales. When people ask me where I work, I tell them Holy Trinity – you know, the Greek church, the one with the Greek Festival. Ah, people know right away which church I’m talking about. I don’t mind, I like it. There’s nothing wrong with being recognized as the priest of the church that has the popular Greek Festival. That’s become my standard introduction to strangers who want to know what I do and where I work. In my more rigid days it used to bother me that people know us for our food and pastries rather than for our theology and liturgy. Not any more. I’ve grown up. Nothing to be embarrassed about. Jesus himself was not embarrassed by who he was and where he came from. That’s the whole point of today’s Gospel reading, that amazing genealogy that Matthew made up. Sure, he made it up to show Jesus came from important stock. But in that genealogy there are men and women not so lofty, not so holy, including some that you and I would be embarrassed to have in our family tree. No matter. God touched down on real earth and real people. Right there at the beginning of the genealogy we find Abraham and Sarah. They were visited by three men who clearly came as representatives of God. They were on their way to Sodom and Gomorrah, to destroy those notorious cities of sin – kind of the Las Vegas of that time. But Abraham bargained with them, trying to convince God not to destroy – partly because Abraham had a nephew living there, Lot, but perhaps also because Abraham knew from personal experience how easy it is for people to sin. God listened and made the bargain with Abraham, but to no avail. He destroyed the city. The story of humankind starts with fire and brimstone, and so it continued for millennia. Then Jesus came, as the Prince of Peace, to bind up the wounds of the people, to preach good news to the poor, to heal the sick, to liberate the captives and the oppressed, to open the eyes of the blind, to proclaim the acceptable year of the Lord. That’s how he identified himself to the people of Nazareth when he started his ministry as an adult. He came precisely for every inhabitant of Sodom and Gomorrah of every place and time. We are all bound, we are all blind in one way or another, we all need good news to come our way. Every time we are in spiritual need, we stand with people of all times – in waiting, anticipation for the release that Jesus brings. And the miracle of Christmas happens every time we need good news, every time we need our eyes and hearts to be opened, every time we need forgiveness. God knows that we need the miracle of Christmas in our lives. Jesus did not choose to mingle with the religious types. He chose to be with the regular folks, people like us. And if he were in Portland in June he would definitely come to our Festival and taste our shish-kebab and baklava and loukoumades and even drink some Greek beer. I’m not sure about the Greek coffee. He can get better coffee in the Middle East. That’s what Christmas is all about. It’s about God becoming one of us so we can have life and have it abundantly. And God provided us with this church as our spiritual home where we can receive Christ in our mouths and hear the good news every Sunday. We receive Christ so we can be received in the kingdom. I want people in Portland to know us as a place where people can taste Christ in addition to our baklava and shish-kebab. But it begins with us, every one of us. “Taste and see that the Lord is good,” says one of our communion hymns. It happens right here. And so Christ is born in us, and lives in us. Let us be a Christmas community year round! God bless you in this season of Christmas and in all 365 days of Christmas! Categories: Sermons | Tags: Christmas, communion, community, Greek Festival | Permalink. You know what is boring? “In a hole in the ground there lived a hobbit. Not a nasty, dirty, wet hole, filled with the ends of worms and oozy smell, nor yet a dry, bare, sandy hole with nothing in it to sit down on or to eat: it was a hobbit-hole, and that means comfort…” These are the opening words of one of the best and most popular novels of the 20th century, The Hobbit, by J.R.R. Tolkien. The third and final installment of Peter Jackson’s overdone and overlong film adaptation opens this week. “…by some curious chance one morning long ago in the quiet of the world, when there was less noise and more green, and the hobbits were still numerous and prosperous, and Bilbo Baggins was standing at his door after breakfast smoking an enormous long wooden pipe that reached down to his woolly toes (neatly brushed) – Gandalf came by.” And Gandalf came to invite Bilbo to an adventure, something hobbits have little inclination to do! So Bilbo invites Gandalf to come back tomorrow for tea instead. “Just before tea-time there came a tremendous ring on the front-door bell, and then he remembered! He rushed and put on the kettle, and put out another cup and saucer, and an extra cake or two, and ran to the door. “I am so sorry to keep you waiting!” he was going to say, when he saw that it was not Gandalf at all. It was a dwarf with a blue beard tucked into a golden belt, and very bright eyes under his dark-green hood. As soon as the door was opened, he pushed inside, just as if he had been expected. He hung his hooded cloak on the nearest peg, and “Dwalin at your service!” he said with a low bow. “Bilbo Baggins at yours!” said the hobbit, too surprised to ask any questions for the moment. They had not been at table long, in fact they had hardly reached the third cake, when there came another even louder ring at the bell. “Excuse me!” said the hobbit, and off he went to the door. “So you have got here at last!” That was what he was going to say to Gandalf this time. But it was not Gandalf…” And so it continued, a dozen dwarves came to tea and thus began the adventure that Bilbo Baggins did not want to join. The first chapter of The Hobbit is titled, An Unexpected Party. Today’s Gospel reading is also about an unexpected party. It was not unexpected in the sense that it was a surprise or unannounced. It had been announced, and invitations had been sent. But it was unexpected in the sense that it was beyond anyone’s expectations. God is always unexpected, always beyond our expectations, always ready to bestow grace beyond measure. I simply cannot understand how anyone could be bored by the Christian message. It’s boring only when you turn it exclusively into a message about heaven. 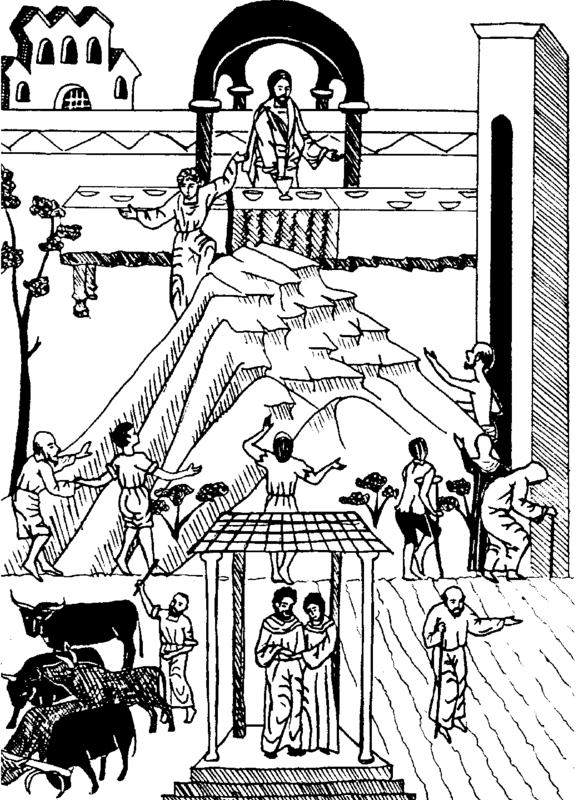 But is today’s parable (Luke 14:16-24) about heaven? In one sense it is. 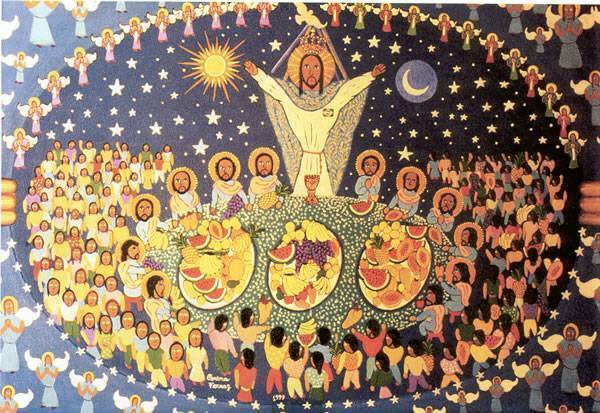 But notice the image chosen by Jesus: a banquet, a party! The parable is even more about life here on earth. God invites us to enjoy life in the best way possible, in his company and in the company of God’s people. The parable is really about community. It asks us: Who are your companions? Who is part of your community? Do you like to keep company with people outside of your circle? And Paul makes it even clearer in the reading today from Colossians, where he writes: “Here there cannot be Greek and Jew, circumcised and uncircumcised, barbarian, Scythian, slave, free, but Christ is all, and in all” (Colossians 3:11). You see, the parable is not so much about us getting somewhere out of this earth, but God coming down to earth in search of us. The “master” is clearly meant to represent God, and the servant who is sent to bring people into the banquet is clearly meant to represent Christ, who came into the earth to seek the lost and the rejected. That is why we read this parable two Sundays before Christmas. It prepares us for the message of Christmas! God came down to invalidate all excuses. As Paul wrote in one of his letters, before Christ came people had excuses, just like the people in this parable have excuses – all valid excuses, by the way. But once God revealed himself to us in the coming of Christ, the excuses are finished. God is building a community that is beyond anyone’s wildest dreams. They say Christianity is losing ground. Superficially perhaps. And if you watch too much Fox News you’ll hear what they call the “War on Christmas.” Forget the propaganda, forget the pessimists; don’t look at things through a narrow focus. The fact is that many who call themselves Christians might be the ones with the excuses. God is casting his nets wide, very wide, and he is bringing into God’s kingdom all sorts of unexpected people – unexpected by the excuse makers, that is. Unfortunately, the church chose to complicate the meaning of this parable by attaching an additional sentence at the end that is not part of Luke’s parable: “For many are called, but few are chosen” – taken from a completely unrelated Gospel passage (Matthew 22:14). The message of the parable is actually the exact opposite of this unrelated appendage! Many people say Christianity is boring. You know what is boring? A life of excuses. THAT is boring! Don’t you get bored listening to people making the same excuses, why they don’t call you, why they forget your birthday, why they can’t stop drinking or smoking? Why they can’t help eating too much? Why they can’t come to Liturgy or help at the Festival? Why your child can’t do better in Math? Don’t you get tired of listening to the same excuses? Well, do you think God enjoys excuses more than you do? St. Paul tells us today to put off the old ways and become new, “renewed in knowledge after the image of [our] creator” (Colossians 3:10) Now that is exciting, and it’s not about heaven. It’s about earth and our life here. It’s about community – community without boundaries; community that knows no boredom, because it is always welcoming others, always embracing change, always welcoming the Spirit of Christ to be in our midst, in our worship, to open our eyes to the divine reality that is here. People call the Liturgy boring. Why come, when it’s the same week after week? I beg to differ. Maybe it’s the people who call it boring who are boring or just bored. Every time I’m tempted not to believe in the Christian message, it’s the Liturgy that pulls me back. I can’t explain it in easy words, so I won’t try. In his first letter, John wrote: This is what we proclaim to you: what was from the beginning, what we have heard, what we have seen with our eyes, what we have looked upon and our hands have touched – we speak of the word of life. “What… our hands have touched” – beautiful. And I may add, what we have tasted with our mouths. “Our Father who art in heaven…” we pray. But God is not just in heaven. “Thy will be done on earth as it is in heaven.” God is on earth. God is with us – Emmanuel is his name (Matthew 1:23; Isaiah 7:14). The one whose birth we will celebrate in ten days. Now that’s something to get excited about. That is not boring. But God meets us here every time. We ask for the Holy Spirit to come upon us and upon the gifts here offered – upon US and upon the gifts. I’m glad you’re here today. I’m glad you’re here to share this eucharist with me. I’m glad you’re here to sit at the banquet. I’m glad you’ve come from all directions of the compass, from so many backgrounds, from different cultures and languages. I’m glad you’re here. But there are many missing, many who have excuses. Will you go looking for some of them? There is still room in God’s kingdom, lots of room. Don’t listen to the pessimists. God will bring many to the party. Bilbo was surprised by the dwarves who crowded into his hobbit-hole. We will be surprised immeasurably by who we will see sitting at the banquet of life – here and in heaven. 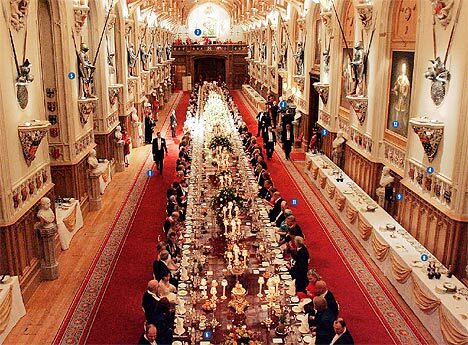 No human banquet can compare with God’s banquet! Categories: Sermons | Tags: church community, parable of the great banquet, parables of Jesus, The Hobbit | Permalink. Today’s Gospel reading, Luke 13:10-17, should be read in the context of the entire chapter 13 of Luke. Jesus heals the woman who was bent over for eighteen years in the midst of various parables and confrontational dialogues. Categories: Sermons | Tags: community, compassion, inclusiveness, Luke 13, parables of Jesus | Permalink.